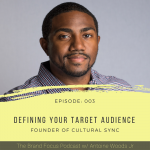 In this episode of the Brand Focus Podcast, we discuss the importance of defining your brand message. Providing insight into why it’s so important to your business and how to approach the process. We also discuss real-life examples of how powerful & impactful a defined brand message can be.